A save-the-princess adventure in a fantasy world, with game text that does a good job of capturing the setting. Emphasis is on determining the function of the magical words and items you come across, with significant character interaction. There are lots of vehicles and NPCs that move independently of the player (which could explain why I always found this game to play slowly on my Apple II). The Angelsoft parser is good, but it cheats a bit, scanning player input for significant words before attempting to break down the entire command. For example, you can type, "BLUE FAERIE, I WOULD LIKE TO TRADE AN OBJECT I'M CARRYING FOR SOMETHING YOU HAVE", and it works, because the game picks out the word "TRADE" before any actual parsing is done. Most Angelsoft titles are relatively common, though you tend to get competition in two areas: PC-playable copies, and fans of the original work on which the game was based (James Bond, Stephen King, etc). 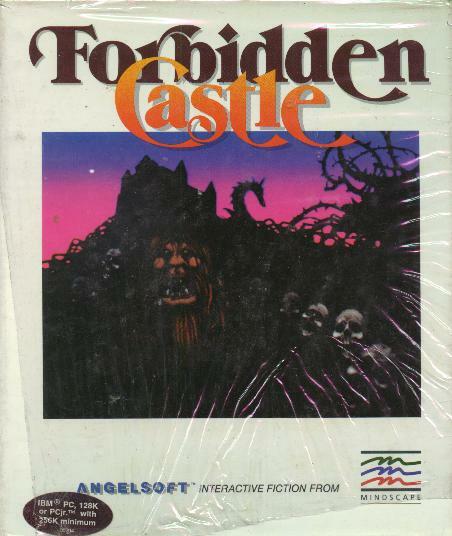 This is one of only two Angelsoft games to be done completely in-house, not licensed from an existing book or film.